Congratulations to all of our student member award recipients! Robert Hume was one of the student club scholars and was selected as a Gates Scholar and a Rotary Scholar. He will be attending Cambridge University to pursue a masters starting in the fall. Matthew Means' Mead Ethics Essay was selected 2nd place nationally, for which he receives a nice certificate and a $800 prize. Kendall Hamm was recognized with the Pinnell Award for superior service to the ASCE West Point Student Chapter. He received an engraved pewter plate. 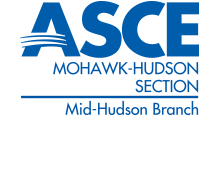 Trevor Lafontaine was recognized with the ASCE Award for Performance, which recognizes the top student in CE404, design of steel structures. Finally, the annual report was recognized by ASCE national with a certificate of commendation in recognition by the committee on student members as an outstanding student chapter (awarded to the top 15%).